April 2016: Total for April. £1 x 56, £5 x 9, £10 x 3 = £131 face value. £1 x 1; £5 x 1 = £6 face value. April kicks off with two notes new to PSS, spotted at the April fair in Dublin. £147 added, see post below. £1 x 52, £5 x 8, £10 x 3 = £122 face value. 68 notes, new to the Ploughman Scan Survey (PSS) added from Whyte's The Eclectic Collector 2016 auction, on 14 May, 2016. RA x 1, RK x 1. There are also two £10 notes and seven £5 notes in the sale which are already recorded in PSS. The lowest grade note is a National £10, heavily repaired, which has been up several times before, always reserved too high! 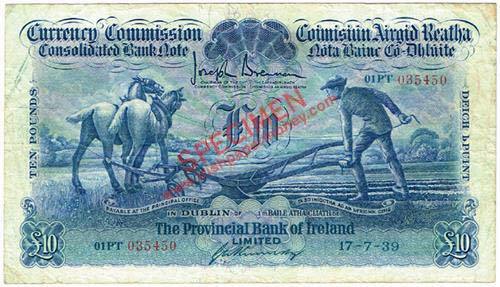 Among these notes is a Provincial Bank of Ireland £10 note with Kennedy signature. This is interesting, as it is one of the rarer notes, but also it is outside of the known run of 17.7.39 £10 notes. It is also well circulated, pointing to the possibility that all notes of this date were put into circulation, even though they were likely extraordinary issue. There is a lot about the Ploughman notes which remains to be discovered. May 2016: Total for May. £1 x 6, £5 x 2 = £16 face value. £1 x 5; £5 x 1 = £10 face value. Things are quiet now, May is struggling! We have a few notes recorded so far. June 2016: Running total for June. £1 x 3, £5 x 2, £10 x 1 = £23 face value. £1 x 1, £5 x 1 added. £1 x 1, £5 x 1 added. Spotted in an on-line sale. £1 x 1, £10 x 1—both low grade notes. July 2016: Total for July. £1 x 8, £5 x 40, £10 x 4 = £248 face value. £1 x 4, £5 x 2 added, from submitted scans. £1 x 4, £5 x 1, £10 x 1 — all submitted notes, except for the £10 note which has turned up in an auction. That auction is shaping up nicely. 3 x £10, 37 x £5 notes added. Grade variable, some nice £5 notes among them. As of 30.07.16 over 8.7% of the total amount outstanding of Ploughman notes has been recorded in the PSS census, including missing data. The census stands at 3139 notes, with a face value of £9,196. August 2016: Total for Aug.
£1 x 25; £5 x 1; £10 x 1 = £40 face value. £1 note spotted. A modest start to a new month. 2 x £1 notes added. Whytes September Collectibles sale has some Ploughman notes in it, mostly £1 notes. Most of the notes counted so far are new to the PSS census, as follows: £1 x 22; £5 x 1; £10 x 1. There are more notes in this sale that haven't been recorded yet. September 2016: Total for Sept.
£1 x 43; £5 x 1 = £48 face value. October 2016: Total for Oct.
£1 x 13; £5 x 3 = £28 face value. All from small auctions. November 2016: Total for Nov.
£1 x 6; £5 x 10; £10 x 1 = £66 face value. £1 x 2; £5 x 1. Heritage auctions has another batch of Consolidated Bank Notes in its preview. No doubt more will be added. £10 x 1, £5 x 8. £1 x 1; £5 x 1. December 2016: Total for Dec.
£1 x 43; £5 x 2; £10 x 1 = £63 face value. Spotted, another Hibernian £5 note on the Heritage auction site. Added 13 £1 notes to the database today. Added 15 x £1 notes, coming up in Whyte's Eclectic Collector sale on January 21 2017. January 2017: Total for Jan.
£1 x 3; £5 x 1 = £8 face value. 17.01.17 I spotted a low grade £1 note on ebay. it's a start! 31.01.17 Added a £1 note. February 2017: Total for Feb.
£1 x 8; £5 x 6 = £38 face value. I spotted a pair low grade £1 notes on ebay. Also, six £5 notes were reported with pics. All new to the census. £1 x 2; £5 x 6. Mrch 2017: Total for Mar. £1 x 8; £5 x 7; £10 x 1 = £53 face value. 02.03.17. Spotted a low grde £1 note on ebay. 12.03.17. Added two notes from ebay. A steady trickle of new items are appearing there currently. Also added two other £1 notes. 16.03.17. £5 x 4, £10 x 1 added. Things are picking up for this month! 22.04.17. £1 x 2, £5 x 1 added. 24.03.17. £5 x 2 added. April 2017: Total for April. £1 x 73; £5 x 7; £10 x 1 = £118 Face value. £1 x 65; £5 x 5; £10 x 1 = £100 Face value. May 2017: Total for May. £1 x 22; £5 x 6 = £52 Face value. 29.05.17: 2 x £1 = £2 added. The May total is adding up nicely. Some of the £1 notes are those from Whytes auction that I didn't get images from originally, others are from various sources, web and notes emailed in. Again, thanks to all who send in pics and scans. June 2017: Total for June. £1 x 6; £5 x 8 = £46 Face value. Eight more Hibernian £5 notes are up on the HA.com website in forthcoming auctions, getting June off to a solid start. July 2017: Total for July. Ploughmans are a bit thin on the ground this month!